The nonprofit sector has a racial leadership gap. It is an unfortunate fact that the percentage of people of color in nonprofit leadership roles – executive director, CEO, board chair – has remained under 20% for the last 15 years, even as the country becomes more diverse. Usual responses to address this gap are finding or convincing people of color to consider nonprofit leadership positions, offering training for job preparation, and once in, incentivizing these leaders from leaving the sector. Yet underlying these solutions are assumptions that people of color are less interested in these positions than whites, that those who stay lack the skills for these positions, and that qualified leaders are more likely to leave. The Center is lifting up an emerging view and understanding. The racial leadership gap is not about differences in background or qualifications, nor is it about skills and preparation. Rather, it comes from organizational and systemic causes. Consider this: BoardSource reported in 2017 that 84% of U.S. nonprofits boards are white, and 90% of their board chairs are white. A comprehensive survey with 4,000 responses conducted by the Building Movement Project, Race to Lead: Confronting the Nonprofit Racial Leadership Gap, found that people of color are as ready as whites to take on leadership roles, but they face unspoken and unconscious biases that prevent those with the hiring power from fairly assessing, recognizing, and valuing their potential. To close this leadership gap, the nonprofit sector needs to address the systemic barriers and practices of those currently governing nonprofit organizations, and nonprofit executives and board members need support moving beyond diversity initiatives, which generally have little staying power, to facilitate ideas and actions toward new solutions. The policies, practices, and organizational cultures in nonprofits that exacerbate these gaps. Finding and crafting solutions requires many voices and many organizations working together, one step at a time, in an ongoing, lifelong process. Walking the Talk endeavors to create change by educating nonprofit decision-makers on the issues of race equity and implicit bias, accompanied by changes in action, leading to measurable results. See accomplishments from the initiative's first year. Although inequities remain stubbornly entrenched in systems and institutions throughout the sector, the profound wisdom, courage, and skills that nonprofit professionals bring to the table every day will help chip away at the barriers and move beyond diversity toward equity. For more information, contact Bridgette Burge, Director of Programs. 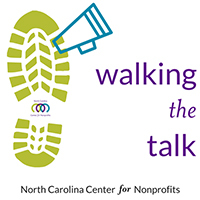 For resources on diversity, equity, and inclusion, visit Information Central, see the 2018 Walking the Talk Webinar Series, and read stories and experiences from nonprofit leaders and colleagues.